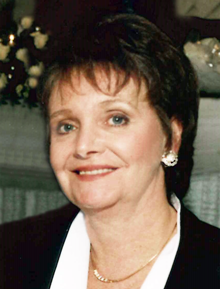 Florentine, Janice E. of East Boston and Lynnfield passed away peacefully on Sunday March 24, 2019 at the age of 71 years surrounded by her loving family. Beloved wife of the late Arthur "Artie" Smith, Jr.
Loving mother of John Giammarco and his wife Leah of Lynnfield. Cherished sister of Larry Florentino and his wife Andrea of Lynn and the late Frank "Brother" Florentine and his late wife Carol. Adored grandmother of Kayla, John Jr. and Nicholas. Great-grandmother of Connor. Also survived by her loving nephews Erik and his wife Stacy and their daughter Eriana and Robert and his wife Emily and their son R.J. as well as many friends. "Nana Janice" to Zara, Holland, Seamus and Sile. Family and friends will celebrate Janice's life by gathering at the Ruggiero Family Memorial Home 971 Saratoga St. (Orient Heights) EAST BOSTON on Saturday March 30, 2019 from 12 noon to 2 pm. Hallmark Health VNA & Hospice, Inc.